It’s peak summer which, for my family, means lacrosse tournaments every weekend up and down the East Coast. My 15 year old daughter, Ava, has a couple of weeks off from her lacrosse travel team. 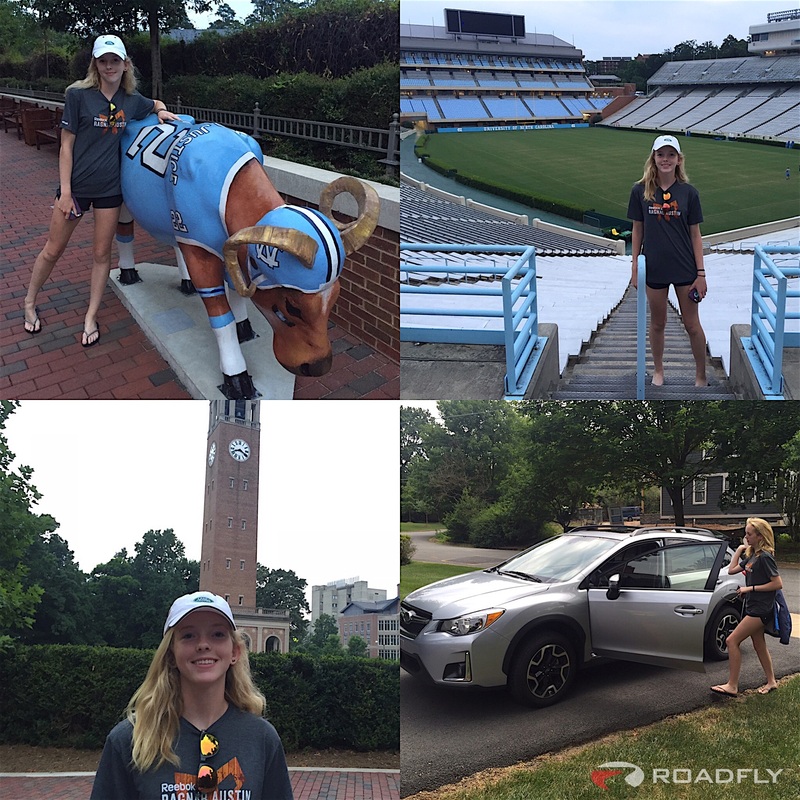 Lucky for her those weeks just happen to coincide with the Summer lacrosse camps offered by UNC at Chapel Hill and Duke. The schools are in Chapel Hill, NC and Durham, NC which are only about 15 minutes from each other, but we live in McLean, Virginia, which is just across the Potomac River from the Georgetown neighborhood of Washington, DC. Flying to the Raleigh/Durham airport doesn’t make any sense, but on the other hand, I was dreading the 5 hour trek up and down Interstate 95. The traffic on I-95 is just unbearable. 75 mph, 35 mph, 10 mph, 0, 30, 50, 70… and the cycle continues, sometimes for hours. I could have chosen to test any of the high-end German luxury sedans to ease the pain which is I-95, but I had a better idea. I wanted to test a car with #1 adaptive cruise control, #2 a comfortable ride, and #3 good gas mileage. I also decided that I wanted to kill two birds with one stone. Ava is only 3 months away from getting her learners permit here in Virginia so we’ve been talking cars a lot. I wanted my test car to meet my I-95 comfort requirements but I also wanted to drive something which is on Ava’s short list for her first car. I chose to test the 2016 Subaru Crosstrek. It’s a very comfortable near crossover and it offers the features I needed to survive I-95. As Ava and I have our conversations about which car she will be getting, there are a few car points which are non-negotiable for me. They include all-wheel-drive, a smaller SUV (if she goes with a car it needs to have a high seating position for visibility), very high reliability rating, excellent crash test results for IIHS’ frontal small overlap and moderate overlap crash tests, and lastly frame architecture which is no older than 2011. A couple of the safety options which I’d like her car to have include blind-spot indicators and adaptive cruise control. The Subaru Crosstrek meets all of my requirements and more which is why I thought it was the perfect car for us to drive on our college tour. It’s too early to know where Ava will be attending college and whether or not she will spend a lot of time driving to and from school, but I did want to factor highway driving into the equation. I want her to have a car which handles high-speed, interstate highway traffic comfortably and easily so what better test than the sometimes high-speed but more commonly bumper-to-bumper, stop and go traffic of I- 95 in the Northeast Corridor. The Subaru Crosstrek earns high-marks from me for offering an excellent adaptive cruise control system. The adaptive cruise control will bring the Crosstrek to a complete stop and then start again in heavy traffic. The Subaru also gets high-marks from me for it’s EyeSight collision avoidance system which will apply full brake pressure to stop the car in an emergency. EyeSight can be switched completely off via a switch near the sunroof switch. I did have to turn it completely off at one point. I guess I was driving too aggressively for it. The system didn’t like my autocross style of driving around Chapel Hill and Durham. Oh please! Exterior styling is different in a good way. It’s basically just a jacked-up Subaru Impreza and what’s not to like about that! The Impreza’s have been on my Top 10 Lists for years and Roadfly has given them plenty of awards for everything from overall value to their “greenness” to the Impreza WRX STI’s bad-assery! The Crosstrek comes with more ground clearance, bigger wheels and tires, and some cosmetic body work which makes it look a little more SUVish. On the inside it’s a very roomy 5-door hatchback with plenty of cubbies and storage places for a college student or empty-nester. I’m a fan of hatchbacks and optimized cargo carrying capacity, both of which the Crosstrek has. Whether you’re moving stuff back and forth from college or hauling home finds from the flea market, the versatile cargo area is perfect! The Crosstrek’s 148 hp @ 6,200 rpm and 145 lb-ft of torque @ 4,200 rpm, 2.0-liter boxer four-cylinder doesn’t put out a ton of power, but mated to the five-speed manual transmission, it will deliver a decent zero-to-60-mph time of 8.1 seconds. My 2.0-liter test car, however, was equipped with Subaru’s optional Lineartronic continuously variable automatic transmission, which adds 168 pounds to the package and slows the zero-to-60 time to 10.3 seconds. Umm, yeah, not exactly quick. Here is an important point to keep in mind if zero-to-60 times are a high priority for you. The Crosstrek is always carrying it’s amazing symmetrical all-wheel-drive system along for your safety and convenience. Make sure you’re comparing apples to apples. In all honesty, the Crosstrek isn’t designed for people who put zero-to-60 times high on their priority list. It’s designed for people who are sensible drivers and are value driven which is one of the many reasons it is on Ava’s short list of cars to consider. As far as highway driving goes and specifically navigating around all the big trucks and left lane hogs on I-95, the new 2016 Subaru Crosstrek handled it all without blinking an eye. The suspension is soft enough to be comfortable and firm enough to provide stability on and off-road. The steering is nicely weighted and the brakes work well and are confidence inspiring. I do have to write that the little Subie handled I-95 while getting pretty incredible gas mileage. 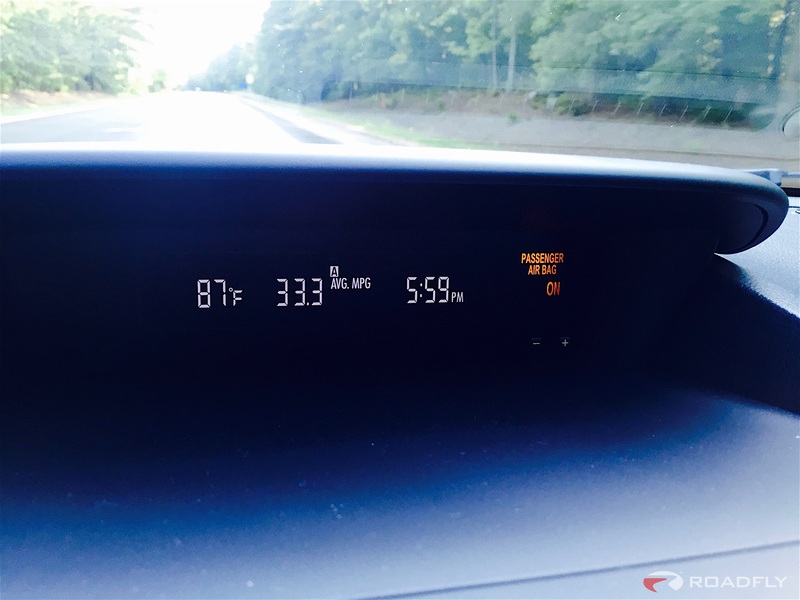 I averaged 33.3 MPG in mostly highway and some city driving. And like I wrote earlier, I wasn’t driving like a typical Subie driver. In the city I was in “car tester” mode and on the highway I had cruise control set at 80 mph. At highway speeds the Crosstrek is comfortable, stable, relatively quiet and most importantly offers the driver an assured and relaxed ride. Driving in heavy traffic on the highway or in DC can be stressful and some cars do it more gracefully than others. The Crosstrek is definitely more on the graceful side. I mentioned earlier how the small frontal offset crash test is important to me, more important than some of the other crash tests conducted by NHTSA or IIHS. The reason is, that where we live in McLean, Virginia, we have a lot of windy two lane, tree-lined roads. In the event my daughter is in a head on collision on one of those roads, it would likely be an offset frontal collision. That’s why I put the overlap crash test higher on my safety requirement list. In the event she swerves off the road to avoid an oncoming driver, then the offset test is a fairly good indication that a passenger should be safe as well. At this point in car safety technology, it’s very well known that if your vehicle stays on the road and your seat belt is fastened, that the chances of major personal injuries are very small. Please don’t swerve off the road! The video below, provided by Subaru, shows a more comprehensive overview of their EyeSight technology. By the way, if you’re wondering why I turned EyeSight off while I was driving around Chapel Hill and Durham, it was because the way I was driving the system kept interceding. Rightly so. It thought I was approaching cars too quickly from behind. If the driver in front of me was turning, EyeSight would sometimes think that my closing speed was dangerously high, so EyeSight would apply the brakes. I guess it was EyeSight’s way of telling me to stop driving like an aggressive a**hole from DC. EyeSight is an extra set of eyes on the road, and if need be, an extra foot on the brake when you drive. 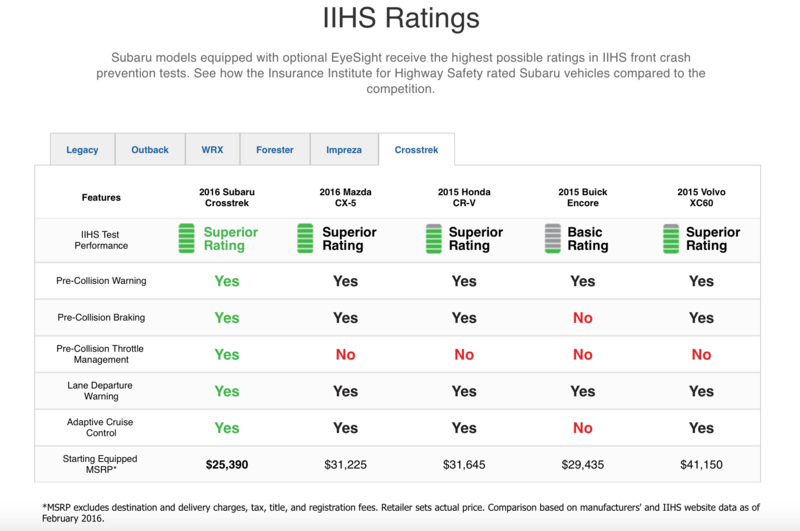 When equipped with Subaru EyeSight, the 2016 Forester, Impreza, Legacy, Outback, Crosstrek and WRX receive the highest possible score in front crash prevention by the IIHS. Overall I really like the Subaru Crosstrek and all of Subaru’s lineup, for that matter. They provide tremendous value and industry leading safety. That’s probably why their sales have been exploding for the last couple of years and also why it’s so hard to find a used Crosstrek! As for Ava and our tours of UNC and Duke, she really liked both schools but much preferred the food and architecture at Duke. Um… neither of those are reasons to choose a school!!! The lacrosse camps were awesome! Coach Jenny Levy from UNC couldn’t have been any nicer and the entire staff at Duke welcomed the players with enthusiasm. Oh yeah, and of course the little Subie is still on Ava’s short list. If you have a son or daughter going off to college, or looking to buy their first car, whether it be new or used, I highly recommend the Subaru Crosstrek. * Includes, Power Moonroof, Starlink, Navigation, Keyless Entry, Eyesight, Adaptive Cruise and a few other things. 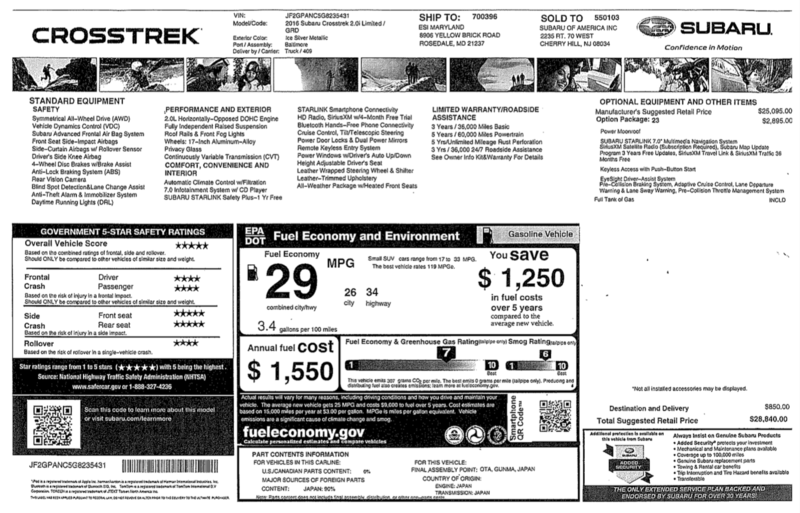 Base Price of the 2016 Subaru Crosstrek in various trim levels.